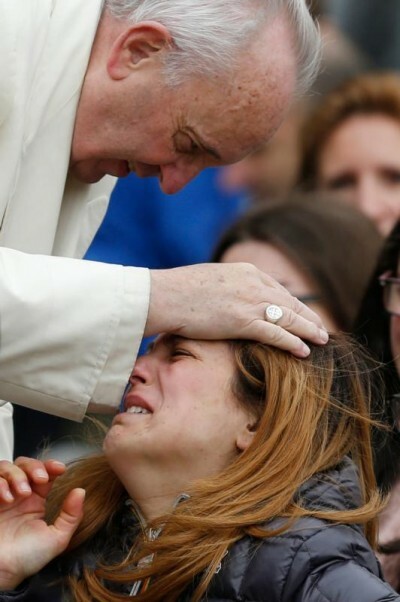 VATICAN CITY (CNS) — God’s love is limitless and the church’s Holy Week services offer Christians a deeper understanding of his infinite mercy, Pope Francis said. The Easter Triduum is a memorial to a love story “that gives us the certainty that we will never be abandoned in life’s trials,” he said at his weekly general audience in St. Peter’s Square March 23. Continuing a series of talks dedicated to God’s mercy, the pope reflected on each day of the Triduum leading to the celebration of Jesus’ resurrection. In remembering the washing of the feet and the institution of the Eucharist on Holy Thursday, he said, Christians recall how Christ shows his disciples that the “Eucharist is love that is done through service” to others. “In giving himself to us as food, Jesus attests that we must learn to break this nourishment with others so that it may become a true communion of life with those who are in need. He gives himself to us and asks us to remain in him in order to do the same,” he said. Christians are called to live Holy Saturday as a day of silence “like it was that very day, which was the day of God’s silence,” he said. In order to fully understand the great mystery of God’s love and mercy, Pope Francis recalled the writings of Julian of Norwich, an English Christian mystic who experienced Jesus’ passion and death through visions. Pope Francis told the pilgrims gathered for his audience, “Let us allow ourselves to be enveloped by this mercy that comes to meet us. And in these days, while our gaze is fixed on the Lord’s passion and death, let us welcome into our hearts the greatness of his love and, like Our Lady on (Holy) Saturday, in silence await the resurrection,” the pope said.